Offices, industrial facilities, institutions and other settings all can make use of plastic nameplates. Nameplates are also commonly affixed to tools, large equipment and automobiles to indicate brand names. Some varieties can even be affixed to clothing and used as nametags. Plastic nameplates are commonly used to indicate people’s names in workplaces and as indicators of room numbers and other information in buildings. Plastic nameplates are an inexpensive alternative to other nameplate materials like wood and metal. While plastic nameplates cannot achieve the same levels of elegance as can gold or bronze nameplates, they are inexpensively produced and replaced, low-maintenance, durable and resistant to the kinds of tarnishing and degradation to which ornate metal nameplates can be subject. Plastic nameplates are easily and inexpensively engraved and painted and can be attached to walls and other surfaces with fasteners or adhesives. The raw plastic materials used for plastic nameplates can be engineered to different specifications; color, texture, shape and all other physical properties are highly customizable. Plastic nameplates, like all other nameplate varieties, vary widely in terms of the possibilities for their shape, color, composition and labeling method. The simplest plastic nameplates are rectangular, thin plastic plates painted or engraved with a few words or symbols. These can be used as door nameplates, desk nameplates and as nametags. When plastic nameplates are used to provide directions or indicate the contents of a room in a building, they can be more complicated in terms of their configuration. For example, plastic plates are often used to indicate the location of restrooms; such plates can be engraved or molded to feature the appropriate words or symbols. The plastic is often engineered to be blue, which is commonly associated with restroom signage. More elaborate plastic nameplates, like those found on automobiles, are specially molded, painted or engraved to maximize brand recognition. These nameplates are usually affixed with strong adhesives. There are many possible plastic nameplate labeling methods. Because of the softness of most plastics, many plastic varieties can be easily engraved by laser engraving systems. 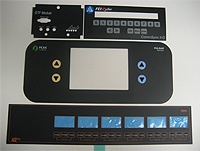 Laser engravers are usually controlled by a computer, so they can produce very precise and repeatable designs. 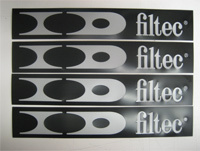 Plastic nameplates can also be engraved by tool bits, chemical-stencil combinations and by a number of other methods. Plastic Nameplates Plastic nameplates are shaped plastic objects of various sizes and compositions used to display names, instructions, the contents of a room and other kinds of information.